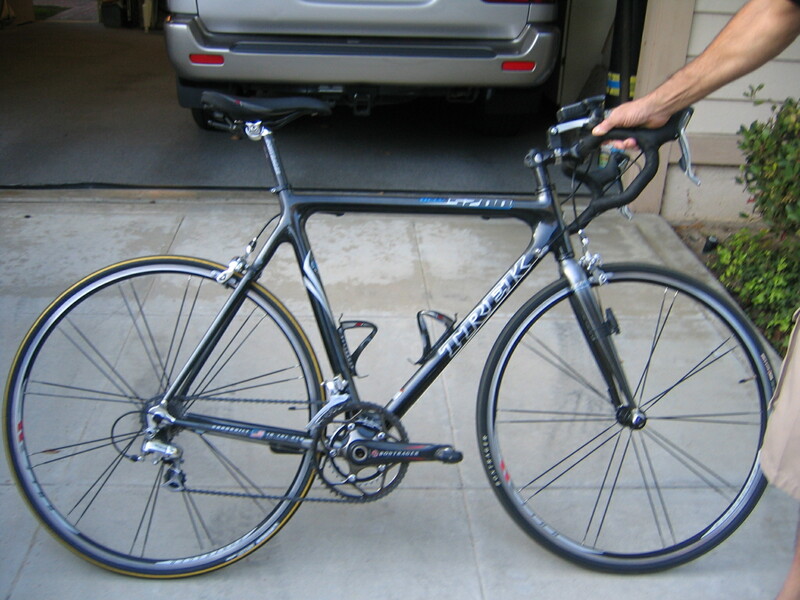 The primary road bike was a 2006 Trek, Model 5200 shown here. This is the basic frame design and technology which Lance Armstrong used in his first Tour de France victory. The bike has a lightweight all carbon fiber frame with a compact double crank and drive train providing 20 different speeds. I chose this drive over a triple or conventional double arrangement since it is lighter, providing the best overall compromise for speed and climbing. The derailleurs are Shimano Ultegra. The basic two adjustments for both front and rear derailleurs are setting the index limit stops and cable tension. Although limit stop adjustment can be tricky and only adjusted while the bike is stationary, cable tension is relatively simple and can be adjusted while underway. The Trek weighs in at 19 pounds and on the day of departure was barely broken-in with about 2500 miles on it. I carried a back-up bicycle on the SAG vehicle, which I never had to resort to in addition to critical spare parts, i.e., tubes, tires, drive chain etc. The back-up bike was a 2005 Motobecane, Cafe Noir. It has a chrome-moly steel alloy frame with a triple crank, 27-speed drive train. The fork is made of carbon fiber. The derailleurs are Shimano 105. Although the bike is a racing/tour design with a flat handle bar, I converted it to a drop-down race configuration giving the rider more hand position options. This is an important consideration for helping prevent numb hands over long riding distances. The Cafe Noir weighed about 20% more than the carbon bike. I took it along as a spare because of its durability, not knowing what I might encounter over some of the rougher sections of Old Route 66. Although I'd been primarily riding the Trek, I had put about 3000 miles on the Motobecane since I purchased it in May 2005. Additional accessories, which I added, included a Cateye Micro-Computer (Cyclometer), a Garmin GPS navigational device (eTrex Vista Cx) and an Oregon Scientific (ATC-2K) Action Camera. The GPS was the heaviest accessory weighing 159 grams while the Action Camera weighed only 125 grams. The Cyclometer weighs only a few grams resulting in a total added accessory weight to the bike under one pound. The Cateye Cyclometer has 10 functions including, 2 trip odometers, a speedometer, average speed, maximum speed, a stop watch, a pace arrow and chronometer. This is a wireless device which has a magnetic pick-up mounted on the front fork and wheel spoke with the read-out mounted on the handle-bar. It is powered by long-life lithium batteries. I calibrated the device and found it to be consistent within 0.1%. It is interesting to note that the major contributor to the inconsistency is tire pressure. The Garmin navigator is a WAAS enabled, portable, rugged, waterproof device designed basically for hiking with an accuracy of 3-5 meters. It features an electronic compass and barometric altimeter for accurate heading (+/- 5 degrees) and elevation (+/- 10 feet) data. It contains a 512 mB microSD card for loading maps and routes into the device for navigational purposes. It operates on two rechargeable AA batteries, providing about 30 hours use between recharges. I plotted my daily routes on a computer, using Garmin's MapSource sofware and uploaded them to the unit. In the summer of 2006, I tested out its navigational capability from LA to Needles in an automobile . It kept me on the right track directing every turn over the entire distance. The Oregon Scientific Action Camera, which was mounted on the handle bar, operates on two rechargeable AA batteries with three resolutions at either 30 or 15 frames per second providing high quality seamless playback in AVI format. The device also includes a built-in condenser microphone to provide sound along with streaming video. 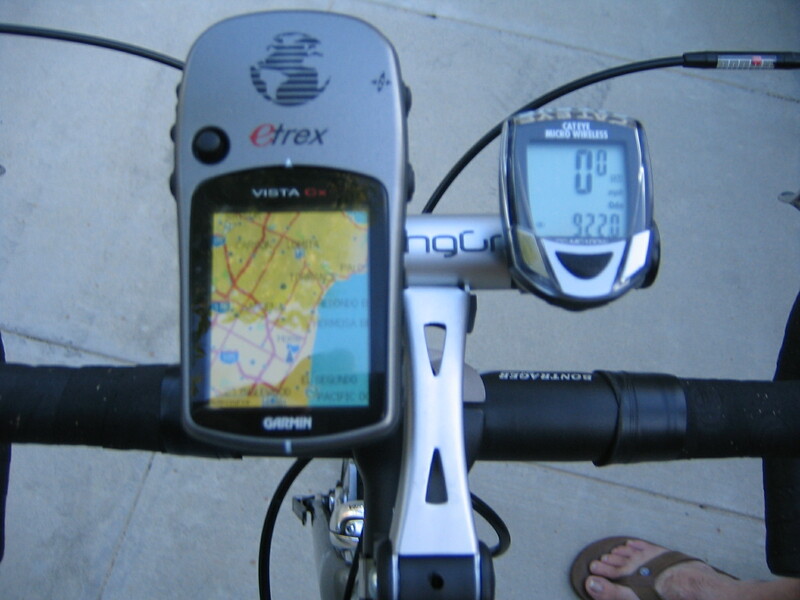 I used this device and posted footage on this website summarizing daily highlights of the ride. 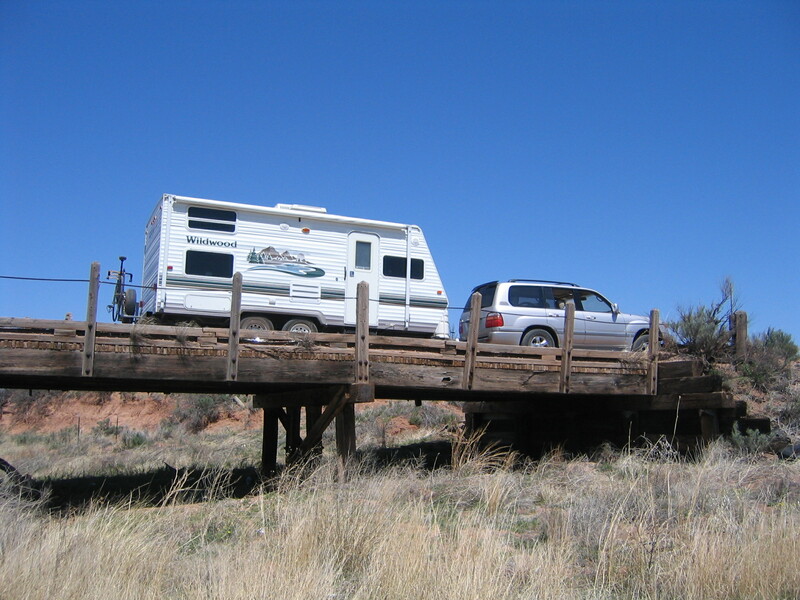 The Support and Gear Vehicle was a 2004 19' Forest River Travel Trailer, Wildwood Model T19FDL, pulled by a 2002 Toyota LandCruiser. A photo of the SAG Vehicle on the road in New Mexico is shown below.